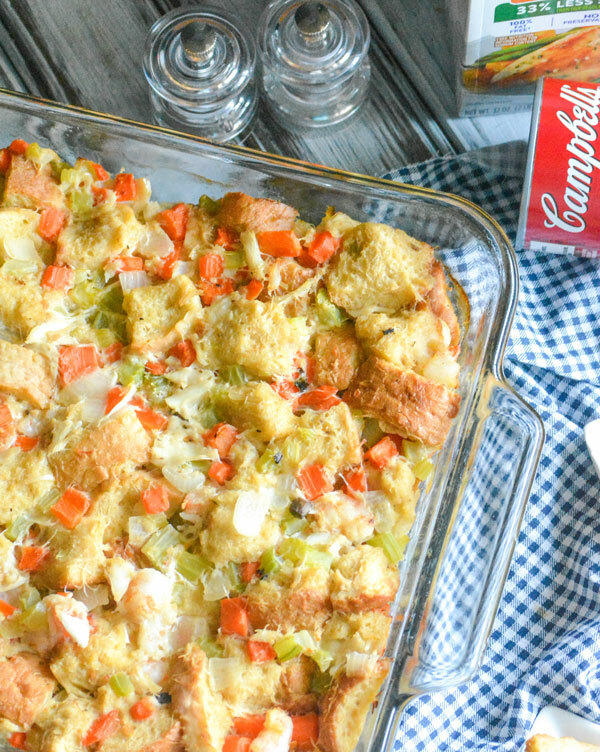 While I adore my Grandma’s tried and true stuffing, sometimes I need a little something new around the holidays. 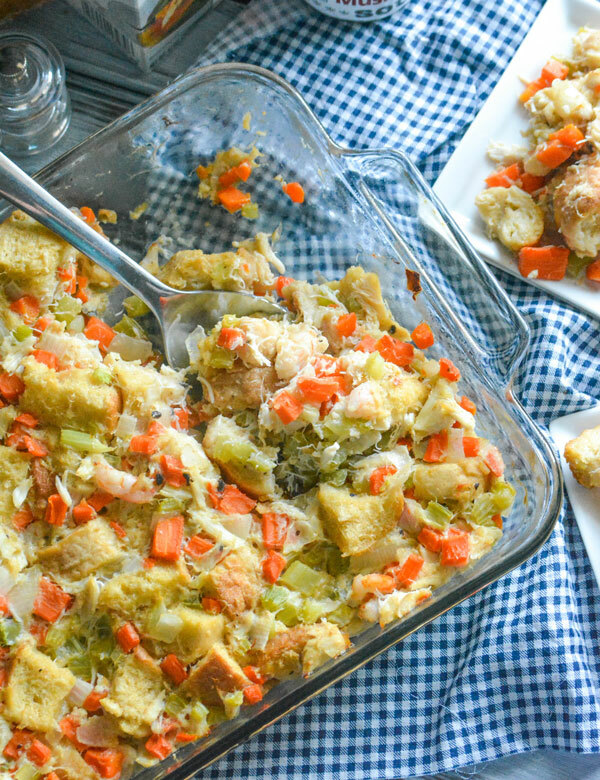 This Mid-Atlantic Seafood Stuffing is a fun new twist to the traditional side dish, infused with a heaping helping of regional seafood favorites, like shrimp and lump crab. I feel like we eat the same things year after year for holiday dinners. Don’t get me wrong, I love our traditional favorites, and adore having & knowing generations of family recipes. Any of our traditional recipes usually require at least one, if not both, Campbell’s® Condensed Cream of Mushroom Soup & Swanson® Chicken Broth. Naturally, I’ve taken advantage of my Sam’s Club Membership and my pantry’s fully stocked with both. If you aren’t familiar with Swanson® Chicken Broth yet, trust me- you want to get acquainted. Luckily, you can sample it in stores on December 21 & 22 at the annual Holiday Taste of Sam’s event, along with Idahoan Mashed Potatoes, just in time to add them to your holiday menu. It’s also the best time to head to Sam’s Club and take advantage of a $1.50 off of Campbell’s® Condensed Cream of Chicken Soup, and Campbell’s® Condensed Cream of Mushroom Soup. This is one deal you don’t want to miss! Speaking of Swanson® Chicken Broth, not all broths are made equal and there’s a definite reason it’s America’s #1 selling brand. Made from farm-raised USA chicken, it’s all natural without additives. I especially love that it’s resealable, so I can take advantage of buying in bulk without having to menu plan for that much quantity in one go. It makes it perfect for creating family-friendly, budget savvy recipes for every day, and even better for recipes I’ll need to feed all my guests this holiday season. Pair that with Campbell’s® Condensed Cream of Mushroom Soup, in a convenient pantry pack without any artificial colors or preservatives? I’m ready to make some magic happen in my kitchen that I can seriously feel good about serving. I’m not above tootin’ my own horn, and when my family truly loves a good recipe that doubles as a holiday side and an everyday dish for mealtime? I can’t help but be proud that it’s both easy, frugal, and included premium ingredients! Ok, so remember earlier? When I mentioned that while I cherish our family favorite holiday dishes, but I still can’t help feeling like we recycle the same recipes year after year? Well, sometimes I can’t help but want something different, something new. My favorite way to incorporate that is a fun new take on an old favorite. Stuffing is pretty standard throughout the season, but I’ve got a scrumptious new way to infuse our traditional stuffing (technically dressing since it’s not going in a bird) with gourmet flavor. Courtesy of a few seafood favs- crab and shrimp- and with a major flavor boost from both Swanson® Chicken Broth & Campbell’s® Condensed Cream of Mushroom Soup. 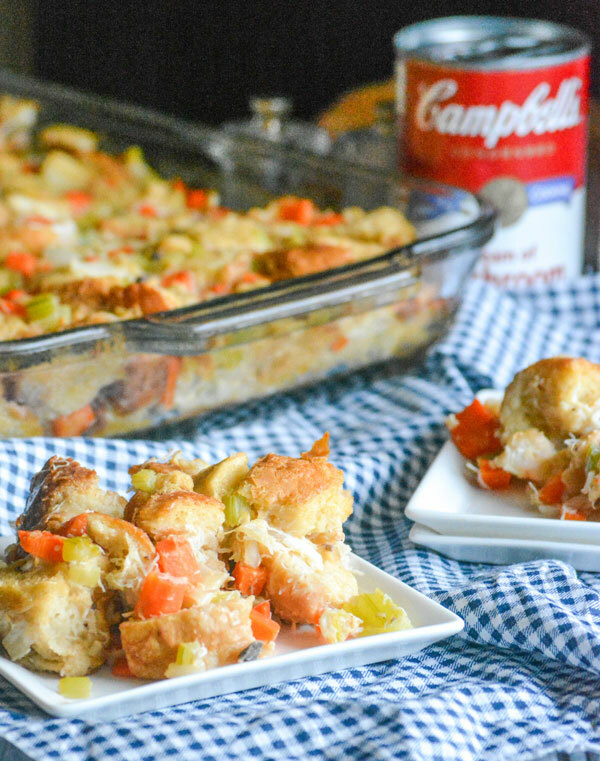 Our Mid Atlantic Seafood Stuffing pays homage to regional flavors, and also honors Grandma’s tried & true method for the fool proof side dish. 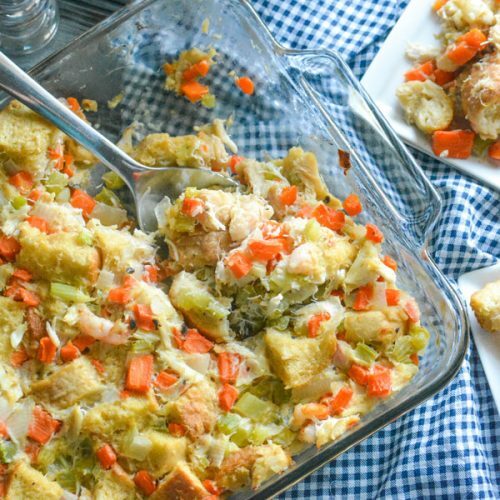 Creamy, savory stuffing with plenty of crispy bits is studded with tender veggies and tossed with Mid-Atlantic seafood favorites, crab AND shrimp. It’s easy enough for any cooking level, but chock full of gourmet flavor. It’s the perfect side dish to a family dinner, especially one shared during the holidays. Check out other great recipe ideas using both Swanson® Chicken Broth, Campbell’s® Condensed Cream of Chicken Soup, & Campbell’s® Condensed Cream of Mushroom Soup HERE. 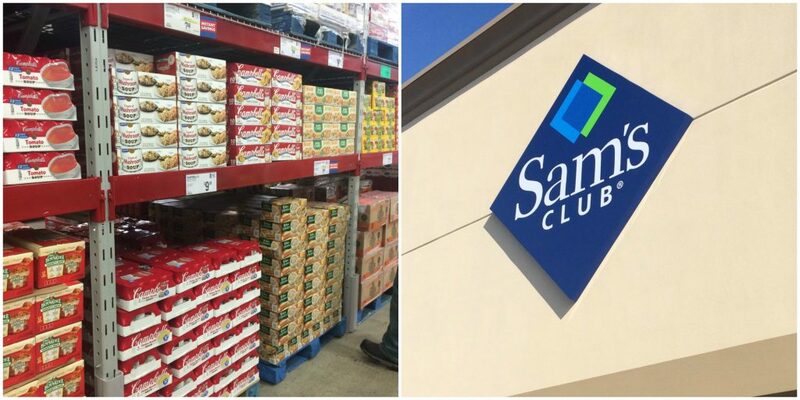 Another thing I love about buying in bulk and saving as Sam’s Club member? I have plenty of these to include in my own recipes, with a surplus. So I’ll be donating my unopened extras to the Central Virginia Food Bank. It’s a little bit I can do to help out others who might not have as much, while I celebrate family & fellowship this season. Please consider donating your extras to a charity of your choosing! 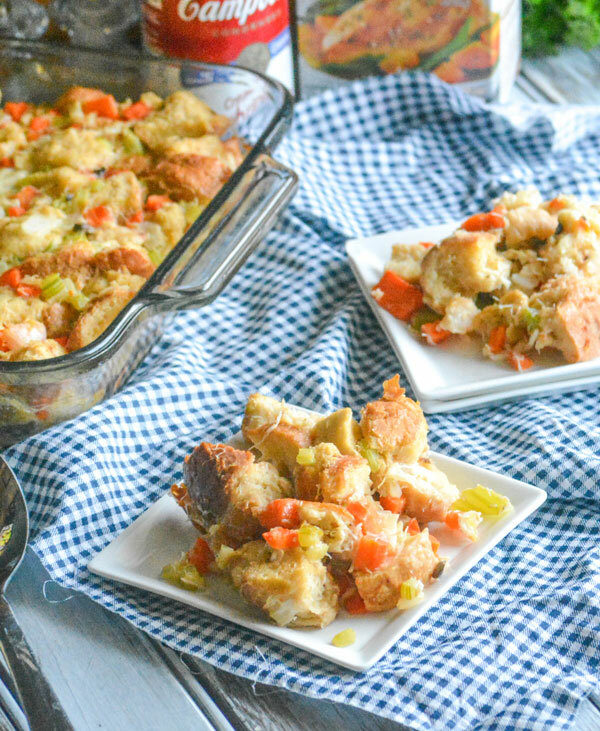 A new spin on Grandma's traditional holiday side dish, this easy savory stuffing includes both crab & shrimp. Spread the bread out onto a large baking sheet in an even layer. Bake at 350 degrees for 10-12 minutes, until nicely toasted. Set aside. In a dutch oven, melt the butter over medium heat. Stir in the veggies, cooking just until slightly softened. Stir in the garlic and shrimp, cooking just until the shrimp turn pink. Quickly stir in the crab. Remove the pot from heat, and stir in the bread crumbs. To a mixing bowl, add the broth, eggs, condensed soup, spices, parsley, hot sauce, and salt & pepper. Whisk until the mixture's evenly combined. Pour into the dutch oven, and stir until the stuffing and liquid are evenly combined and everything's evenly coated. Lightly spray a 9x13" baking dish with non-stick cooking spray. Transfer the stuffing into the dish, and use a spatula to spread it out evenly. Cover the dish tightly with foil. Bake at 375 degrees for 30 minutes. Remove the foil, return the dish to the oven, and bake an additional 30-40 minutes, or until top is golden brown & toasted. I never thought about making a seafood dressing. I would love it but there are a few members of my family (adult and kids alike) who would not like it. That’s great your 4 boys like it! Thanks for sharing with Fiesta Friday. I hadn’t either until this year. I love the twist it gives it! Ooo… I wonder if hubby would eat this seems though he doesn’t like traditional stuffing. 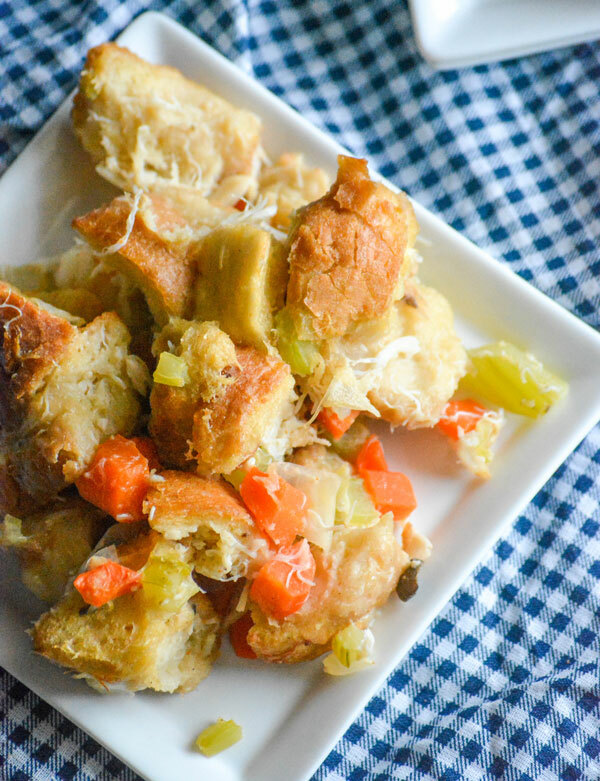 I never thought of adding soup to stuffing either – you’ve given me lots of ideas! Thanks for bringing to Fiesta Friday – don’t forget to add all three links so your readers can see where you party (& for a chance to be featured)! I love twists on our more traditional meals. These were a winning combination for our family!